Castlevania: Symphony of the Night (SOTN) is the first game in the Castlevania series to feature a large free-roaming world - with interconnected areas and tons of monsters, bosses, items and abilities that demands (and aids) exploration and backtracking - as well as RPG elements like stats and experience points (XP). Its influence can still be observed in many games nowadays. What I enjoy most: Exploring the castle while looking for the many secrets and even more items. You play as Alucard, the son of Dracula, who is awaken in Dracula's castle 300 years after you helped Trevor Belmont defeat Dracula (in Castlevania III: Dracula's Curse). You eventually found out that Richter Belmont, the protagonist of Castlevania: Rondo of Blood, has become the lord of the castle. While Castlevania games prior to SOTN featured hidden paths and non-linear world design, SOTN took inspiration from the Legend of Zelda series and created a large, interconnected castle designed to be explored and zones to be visited repeatedly. This kind of non-linear, interconnected map design in a 2-D action-platform world remains the staple of Metroidvania games to this day. Similarly, the way ones unlock paths and explorer further and further in this game - for example the high jump, the double jump, or the transformation into flying creatures or non-corporeal entities - are also widely used in today's Metroidvania games. The castle in SOTN is quite large, and there are definitely dead ends. But I feel one is expected to explore every square of it to look for ways to proceed, and dead ends often just mean one has to return later when you are armed with a new ability. There are also many many items to discover - some are more useful than others, but it does appeal to the spirit of a Collectathon. Compared to later games in the series, as well as most more-modern games, the pacing is quite slow. However, from a perspective of a younger gamer who has more time than games to play, SOTN does reward spending time in it so that you are familiar with every nooks and crannies of the castle. One major twist in the game is that there is an inverted castle which one can unlock after you defeated the final boss of the first castle. Here, the exploration also shifted gear. The layout of the inverted castle is exactly the same as the normal castle, only upside-down. Having beaten the normal castle, you are also armed with all the major movement abilities. In other words, there is no longer any surprise as to where everything is, or arriving at dead-ends. What one has, on the other hand, is a place filled with tougher enemies, loads of new items, new bosses, and five relics to collect - the whole castle open for you to freely run around, in any directions and in any order you like. The pacing and feel of the inverted castle is much different from the first, and there are definitely people who are not impressed by it because of its lack of structure - some even called it pointless. But as an extra, albeit very large, level, I personally do not mind having a completely new place where I can freely explore and use all the powers I gained throughout the game. Alucard has access to many weapons throughout the game, but most are swords and daggers with the same horizontal attack of different speed. Even other weapons like rods, spears, and fist only offer slight difference in terms of attacking arc. However, there are a few special weapons (e.g. Muramasa and Crissaegrim), and special abilities that require fighting-game-like inputs. There is also the shield rod, which activates the special ability of the equipped shield. These shield abilities range from the overpowered "Circle of shield", to summoning AxeLord, to a temporary stats boost. Similar to Castlevania games before and since, the main aspect of combat is still movement and dodging enemy attacks. Even if you are capable of out-damaging the enemy, the knock-back of enemy attacks are so strong that you really do not want to get hit at all. Gamers who played earlier Castlevania titles or other action games from the same era might find SOTN to be on the easy side. And this is partly due to the fact that there are XP, level up, and stats in SOTN. Although the game employs some scaling for experience points (i.e. diminishing XP gain for over-leveled character), the difficulties of the enemies are not scaled, and ultimately one can always beat any enemies by being over-leveled. However, for most gamers, it provides just enough challenge not to be boring - although there are spikes in difficulties that the more casual gamers might find frustrating. I was never really a console gamer, and so I only finished SOTN in the past month - AFTER I played all the Castlevania titles for GameBoy Advance and Nintendo DS, as well as modern titles like Hollow Knight and Ori & the Blind Forest. 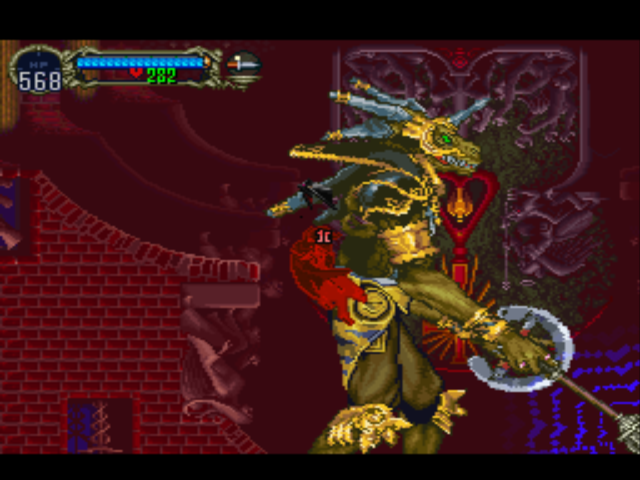 I am not sure I can honestly say that SOTN is the pinnacle of Metroidvania design; nor would I say it is my favourite Metroidvania - but it is definitely still a hugely enjoyable game, with lots of things to do, to explore, and to conquer. Playing through it, I can also see its influence on so many other games I enjoyed throughout the years. And one cannot help but appreciate the innovation and brilliance behind many aspects of the game.